Well folks, with this write-up, I have officially removed one establishment off of our “Un-Contenders” list. Brocach on North Water has been replaced by Three Lions Pub. Their original location on North Oakland has been there for quite some time. This is the second (as far as I know) bar for this group. For as many excellent brunch places we have in Milwaukee, there sure are a lot that are not open on Sundays. After going back and forth with my sister-in-law on where to go/what was open/who has a good menu, we finally landed on Three Lions Pub. Mix: The homemade mix is good. Very traditional with a little sweet touch. It was a smooth flavor but heavy in the horseradish (which I love). The mix is on the thicker side. Not spicy at all. No thrills, no surprises! Garnish: The garnish at Three Lions was super simple. It was a pickle spear, olive, pearl onion, lemon and lime. Seeing how fun their menu is, they could easily dress it up with a pretzel, scotch egg… however, it was unnecessary to dress up. The mix was good on its own! Chaser: I chose a Spotted Cow chaser. Buzz: Although I was on an empty stomach, I didn’t catch a buzz from here. Cost: Bloody Mary’s are $6 on Sundays! Overall, I’d go back. I thought the food was really good (I had a salmon hash) and the Bloody Mary was a-okay! 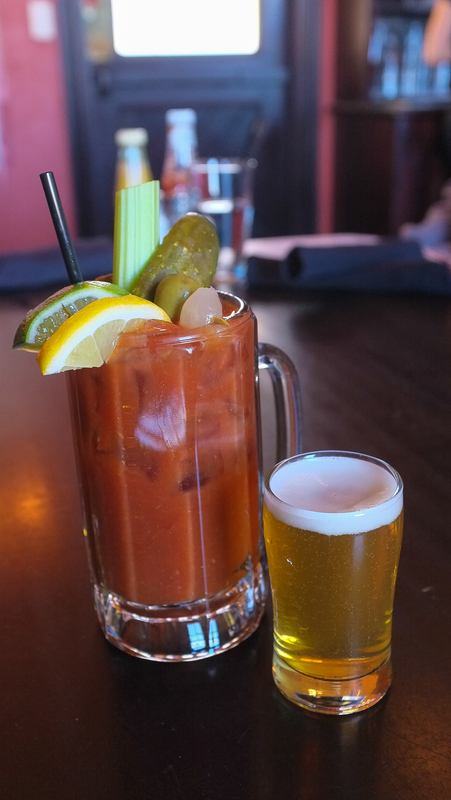 This entry was posted on March 15, 2015 by Shannon in Bloody Marys in the area and tagged best bloody mary, Bloody Mary in Milwaukee, bloody mary wisconsin, english brunch, Milwaukee, Soccer bar, Three Lions Pub, Water Street.